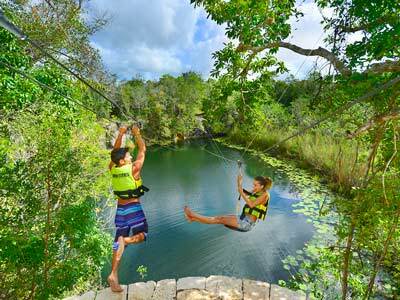 Be amazed by the spectacular natural rock formations of the cenotes in the Riviera Maya and experience a fantastic adventure with exciting activities, including canopy tours over the Xenote Iik cenote. Immerse yourself in this magnificent natural setting as you launch yourself from the platform and glide along the steel cables. Face the dark depths of the Lu’um cenote as you rappel down the limestone walls and swim in the cool, clear waters below. The beautiful surroundings make for an unforgettable adventure. On this tour you’ll also kayak and tube in the Ha and K’aak cenotes, where the natural scenery and lush vegetation with lilies and other plants creates a dream setting. Go ahead and book your spot on this wonderful tour and have fun exploring these unique cenotes, along with certified guides and excellent security measures.